I just wanna check if this are the right parts before I order them. is it for 5V source? Go for some 6,10,18 Ohm also, it's just some cents and you can try other values too. You need 10 Ohm for 5V. ...then it's ok, go for 30Ohm. Take the other resistors too (18, 22Ohm for battery build and 6, 10, 18 for charger build), in case you want to go for a charger build later. You will see that battery do not last very long. Well ive made my facetrack but i got 2 problems. 1. Theres other method to create visible light filter? I mean i dont have floppy disk, and move tape will be hard to get, i was saw a guy whos use a black foil used to trash. someone do it like that? 2. Most iportant. My set use 9v battery and i use 120Ohm resistor, i think its to big value, from calculations minimum should be something like 62omh, so what wil be the best? I ask cuz i cant find answers here. 2. Do you have the specs from your LEDs? 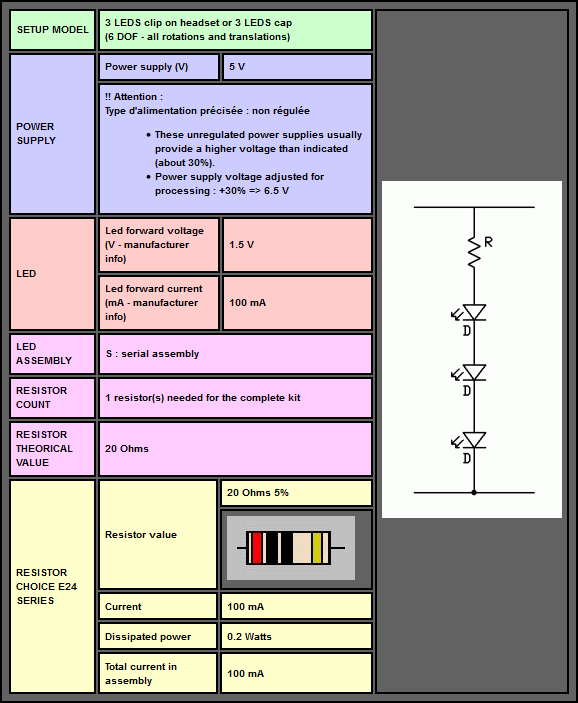 go for a serial assembly with three LEDs. You need one 56 Ohm resistor. Take care to choose a 0.5W, a 0.25W will heat to much. guhh. i was try with Filter, and i fail all the time XD. RGB filter fail dunno why, but my PS3 dont see any diod. Black foil same. I will try with scoth type. but... im not sure it will help. You're sure that the LEDs are working. Did you check it with no filter at all? The ir-filter of your PS3 is too strong or the LEDs are not bright enough. Check if you can modify the PS3. Hi, thank you very much for the information in this thread. I just wanted to post here, as it seems active, to make sure I have things planned correctly because I'm no good at understanding electronics. I'm planning to make a 3-point cap in serial using SFH485Ps. I have an old cell phone charger with an output of 5V, 0.7A I'd like to use. Here's what the site's LED Assembly Wizard says, does this seem correct? can you say what kind of charger it is? Is it a switched mode power supply or a unregulated power supply? The older ones are mostly bigger and heavier, due to the transformer and the regulated switched mode power supply are fine and light (most usb-charger are switched mode supply). If it's an older one the 20 Ohm resistor is okay. Take a 10 Ohm for usb charger.